Here's my pass defense vs receiver heat map for week 11. This is a great deal more in-depth than a simple CB vs WR system. With this one single chart I can (and do) pick my baseline list of players to use in our DFS optimal lineup tool. 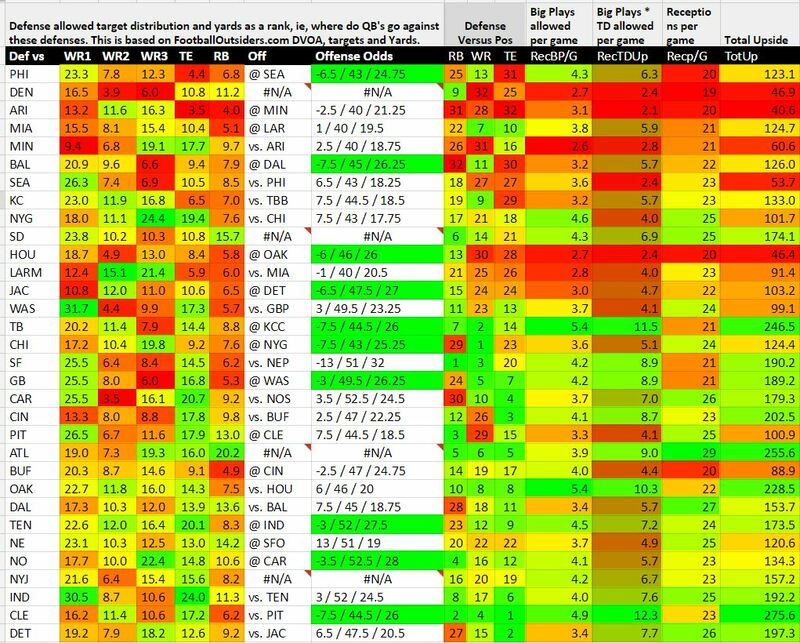 I also use my heat map and rankings when setting my regular fantasy league lineup. Jim T. emailed me yesterday and asked "Just found your DST vs receiver heat map a couple weeks ago. Very intriguing but I'm still trying to understand what it all means." I'm going to break it down for you a bit more in-depth this week. Green means the defense is allowing a lot of points, yardage and/or touchdowns etc. Red means the defense is stingy / strong. Yellow means the defense is average. You read the chart from the middle out. Start with the games with the best Vegas Odds then look at the opponents (DST) fantasy points allowed (defense vs pos). Looking at the "defense vs pos" column you can see where that defense is bleeding points. Then you can get more granular and use the 2nd, 3rd, 4th, 5th and 6th columns to see which receiver type is most advantageous. RecBP/G: The number of big plays allowed on average per game. Big Plays are plays of more than 20 yards. RecTDup: This is the average number of big plays per game times the average number TD's allowed per game. Recp/G: This is the average number of receptions allowed per game. TotUp: Total upside is a measure of the previous 3 columns. In touchdown only league you'll want to may more attention to RecTDup. In PPR leagues you'll want to focus on Recp/G. When playing DFS tournaments I like TotUp. WR1/WR2/WR3/TE/RB: This pin point where the defense bleeds fantasy points the most, on average. Vegas Odds: We only care about fantasy points. Vegas is pretty darn good at estimating the outcome of NFL games. The "Offense Odds" is broken down as spread / over under / implied points. 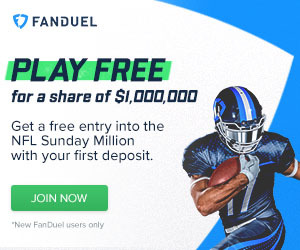 I explain how to utilize the Vegas odds when playing fantasy football here. But one over arching rule is implied points, you usually want players on teams with an implied team total of 25 or higher. I highlight the best odds in the chart below. While looking at each match-up create a list of upside players to use later when building lineups. The chart tells me that Latavius Murray is due for a big game. Here's how I came to that conclusion. HOU @ OAK and Oakland is 6 point favorite with an implied team total of 26 points. Remember we want to play running backs on teams projected to play with a lead and a team total higher than 25. Now I look at fantasy points allowed and the receiving numbers, all good. Houston is allowing the 13th most fantasy points to the running back position. When teams have the lead they run the ball. And based on these numbers they will obtain the lead with Murray. But wait, Murray is projected as the 14th most productive running back in our optimal lineup tool. On other sites I see Murray range from RB4 to RB15. What gives? Why isn't everyone on Murray this week? Projection systems are really good at finding average projected production. When using a heat map like this we're really gold mining for the upside picks. Houston hasn't had much competition this season. And remember, they don't have J.J. Watt in the lineup. Here's how well other running backs have done versus Houston this season.